Well, we finally finished our wall of fame (or shame) with the completion of the final custom framed Vinson picture and plaque. These custom framed pictures and plaques have been a work in progress for 8 years now ever since I climbed Aconcagua for the first time in January 2006 and my dad surprised me with the first custom framed composite including the summit picture, plaque, and permit of this series of composite pictures. I loved this very thoughtful present from my dad so much I decided to continue this same idea with each additional mountain of the 7 Summits we would climb. Yes, its expensive to do, especially with the plaque and custom framing, but I think worthwhile in the long run to have these framed composites for our lifetimes and for the memories. We always try to locate the climbing permit below the plaque in the composite, but Kosciuszko and Vinson did not have any permits. I think we could have used the Kosciuszko National Park pass, but that’s not very exciting and I believe we just drove past the entrance gate anyway and didn’t even get a pass. Whoops. 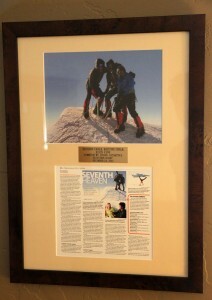 As for Vinson, there was no climbing permit as no one country owns Antarctica, but we used a reduced size version of the Vail Daily article in the location on the composite where a permit would go. Unfortunately, the original Aconcagua composite picture has been relegated to the guest bedroom, but totally understandable as it wasn’t part of Kristine and my 7 Summits endeavor. So, I guess wherever we go or move to or new home we may buy down the road, these composites will come with us to remind us of the wonderful 7 Summits journey we experienced together. Ha! Well, not yet Natalie. Maybe they’ll want to buy our house as well. That would be sweet.